Free event although park entrance fees apply. Being back at the Gallery in Hawai‘i Volcanoes National Park we merrily invite you to join us for our Member’s Appreciation, Christmas In The Country Preview event on Friday, Nov. 16th at 5:30PM! Featuring the 19th Annual Invitational Wreath Exhibit that continues through January 1 st, 2019, this year’s Christmas in the Country promises an abundance of art and aloha to kick start your holiday season. 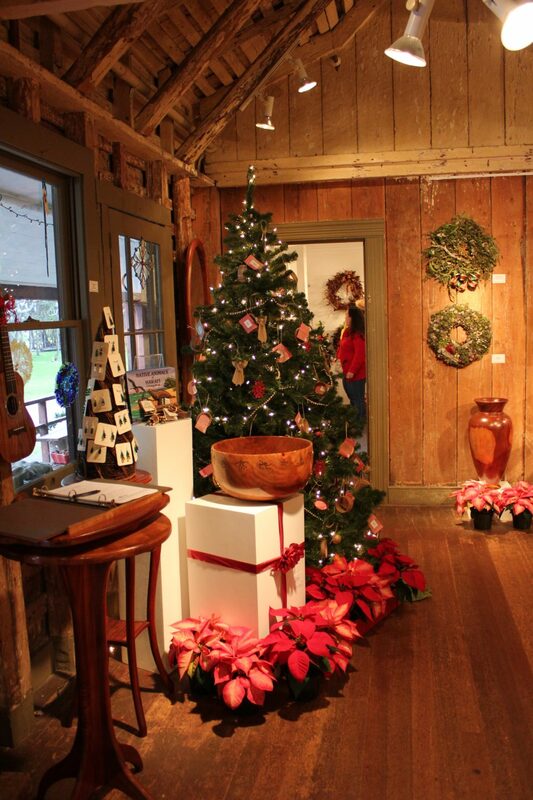 Beginning the Friday before Thanksgiving, VAC Gallery in Hawai‘i Volcanoes National Park creates a merry scene of an old-fashioned Christmas inside its 1877 historic building. In addition to the exquisite artwork Volcano Art Center has become known for showcasing year-round, you will find unique holiday offerings of island-inspired gifts, ornaments and decorations made by Hawai`i Island artists, including VAC exclusives. The concurrent 19th Annual Invitational Wreath Exhibit presents one-of-a-kind wreaths in a variety of imaginative media, techniques and styles, from the whimsical to the traditional. “Those looking for truly original wreaths as well as one-of- a-kind , handmade gift items will not be disappointed by the selection created by our local artistic community,” states gallery manager Emily C. Weiss. This year’s exclusive members-only preview party will begin with a special hula performance performed by Pele & Kekoa Harman with Hālau I Ka Leo Ola O Na Mamo and musical entertainment by slack key guitarist Randy Lorenzo. As always the VAC and its board of directors go all out providing delicious food, wine and champagne as a special thank you to member’s and their support throughout the year. The VAC feels that the weekend before Thanksgiving is the perfect time to set aside time and thanksgivings for friends and community. We sincerely hope you will join us in the festivities. If you can’t make it on Friday night please know that we will be celebrating all month long. Visit www.volcanoartcenter.org for the most up to date offerings of holiday cheer and mark your calendars! Member Appreciation Reception and Christmas in the Country Preview Party. VAC Members are invited to be the first to view the full collection of unique wreaths and high-quality handcrafted decorations and gifts offered only during Christmas in the Country. Enjoy complimentary gourmet pupus, mulled cider and champagne, prize drawings and your membership discount. Not a member? Joining is easy and secure at www.volcanoartcenter.org. VAC members may bring a guest for $15. Held at the VAC Gallery in Hawai‘i Volcanoes National Park. Free, park entrance fees apply. Volcano Art Center’s Annual Christmas in the Country. Special holiday celebrations include art demonstrations, print and book signings by VAC Gallery artists, plus a fine selection of quality handcrafted decorations and gifts offered only during the holiday season. Held at the VAC Gallery in Hawai‘i Volcanoes National Park. Free; park entrance fees may apply. Volcano Art Center’s 19th Annual Invitational Wreath Exhibit. Gallery artists working in a wide variety of media, materials and techniques present their highly creative concepts of ‘wreath’. This year artists were invited to explore the concept of being “Home For The Holiday’s” in their wreaths, inspired by the 4 month closure of Hawaii Volcanoes National Park. Donʻt miss these fun, creative wreath designs! Held at the VAC Gallery in HVNP. Free; park entrance fees may apply. Hula Kahiko featuring Kumu Haʻamauliola Aiona with Ke Kula o Nawahiokalaniʻopuʻu Public Charter School. The Volcano Art Center’s 2017 Hula Arts At Kīlauea program continues with a hula kahiko presentation which includes storytelling, chant, and hula blended to create a journey through Hawaiian history and legends performed by the students. The 7th & 10th grade students of Ke Kula ʻO Nāwahīokalaniʻōpuʻu will share famous stories of ancestral gods, famous chiefs, and significant role models. This free cultural event is supported in part by a grant from the Hawai`i Tourism Authority, Community Enrichment Program. Held at the Pa Hula in Hawaiʻi Volcanoes National Park. Free; park entrance fees apply. Book and print signing with Kathy Long! Kathy will be on hand signing her extensive collection of prints which represent her many years of dedication to Hawaii’s unique culture captured in paint and pastel. Held at the VAC Gallery in HVNP. Free; park entrance fees apply. Lauhala ornament demonstration by Jelena Clay! Join master fiber artist and nationally recognized gourd artist Jelena Clay, who produces a variety of contemporary and traditional works in every natural fiber she can find. Her interest in all Hawaiian art forms led her to lauhala weaving which she now graciously shares through her teaching. Jelena will demonstrate making lauhala stars which participants can take with them. All supplies provided free of charge. Held at VAC Gallery in Hawaii Volcanoes National Park. Free; park entrance fees apply. Held at the VAC Gallery in HVNP. Free; park entrance fees apply. Christmas in the Country Expands to Niaulani Campus. Come celebrate the spirit of the holidays and Also enjoy members of the Volcano Hui displaying handmade art and gifts as part of the annual Volcano Hui Tour. Beautiful live poinsettia will be on display and available for purchase to enhance your home for the holidays as a fundraiser for the Volcano School Of Arts and Sciences. Located in VAC’s Niaulani Campus, at 19-4074 Old Volcano Road, in Volcano Village. Aloha Friday: Lei making with Kaipo Ah Chong. Tropical Agriculture farmer Kaipo Ah Chong will share his expert lei-making skills with VAC visitors. As a member of Halau Na Kamalei, his unique experience marries the science of agriculture with Hawaiian lei and hula traditions. This free cultural event is supported in part by a grant from the County of Hawai`i, Dept. of Research and Development and the Hawai`i Tourism Authority. Free; park entrance fees apply. Make a Holiday Card! Join VAC gallery staff in making a one-of-a-kind, hand printed, woodblock holiday card using the designs of VAC`s beloved artist Dietrich Varez. Since Dietrich is unable to attend this year`s festivities he has offered to share his art. He and his wife, Linda Varez, are loaning Dietrich’s small, prized hand carved, linoleum blocks to be used to create unique holiday cards which participents can take to share with family and friends. All supplies provided. Held at The Volcano Art Center Gallery in Hawaiʻi Volcanoes National Park. Free; park entrance fees apply.